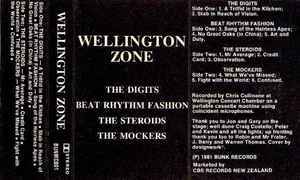 Recorded by Chris Cullinane at Wellington Concert Chamber on a portable cassette machine using coincident microphones. Thank you to Jon and Gary on the stage; well done Craig Costello; Peter and Kevin and all the lights; up fronting thank you too to Robin and Mr Frater, J.Barry and Warren Thomas. Cover by designwork. Track A4 is printed as "No Great Oaks (in China)" on the cover, but as "No Great Oaks" on the cassette itself.